Lot 554. Anonymous. Ca. 214-212 B.C. AR quinarius (16 mm, 1.79 g, 3 h). Rome. 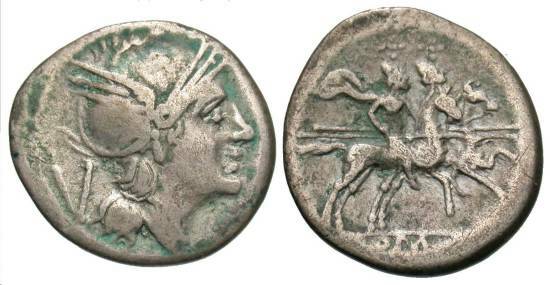 Head of Roma right, wearing winged Phrysian helmet; to left, V / ROMA, Dioscuri charging right on horseback with couched spears. Toned, minor deposits. Nearly very fine.